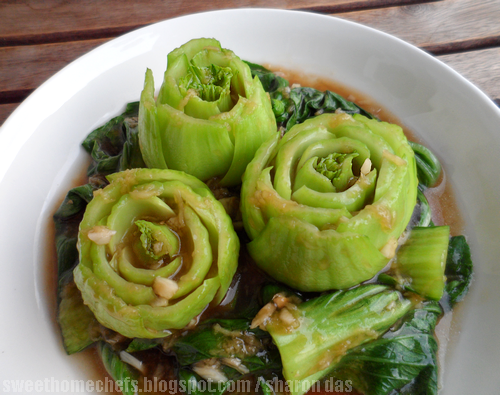 Bok Choy Flowers (the decoration) have been a regular feature in my meals ever since I learned how to do them. It's hard not to get carried away with something this pretty and too easily done. Besides using it as a centerpiece on several noodle and rice dishes, I also serve it the typical oyster sauce way along with white rice. This recipe is just one of the versions I cook regularly. 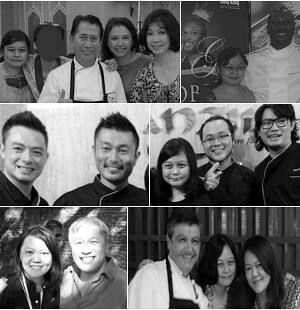 When it comes to working with oyster sauce, I let my moods take over so I end up with a variety of gravy. Sometimes I use onions instead of garlic, sometimes I add a tablespoon of rice wine, sometimes I sprinkle in a bit of black pepper. You get the idea! 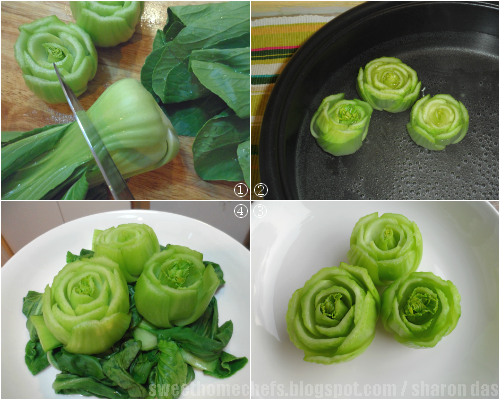 1) Slice bok choy stems away. This makes the flowers. 2) Blanch bok choy in water. 3) Admire bok choy flowers for a bit. 4) Arrange bok choy on serving plate. 1) Blanch bok choy (stem first because it takes longer, then leaves) in boiling water until almost cooked. Leave aside on a strainer. Immediately begin making the sauce (below) to pour over. 2) Heat oil in pan. 3) Saute garlic and ginger until lightly browned. 4) Add water, fish sauce and oyster sauce. Stir to combine. 5) Once it begins to boil, switch the heat off. Stir in tapioca starch to thicken. 6) Place blanched bok choy on a serving plate. Pour oyster sauce over. 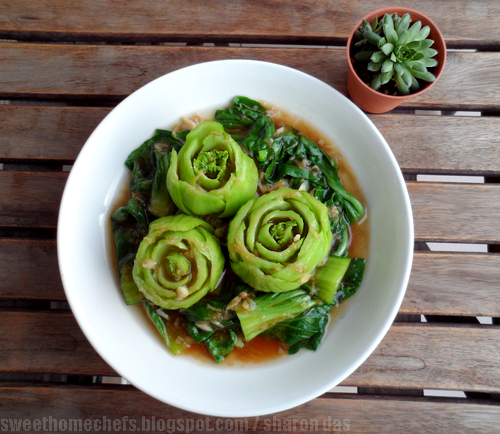 Bok Choy Greens - Well, don't wait too long to eat it! The "flowers" make all the difference to the dish! Looks delicious. I'll have to wait till it gets cooler in order to make this dish. That is when we get these greens. On my must-do list now! Exactly why I am so hooked on it! Beautiful presentation, Sharon. The oyster sauce pairs so well with bok choy. I enjoy cutting my veggies this way too ever since I caught the sight of these presentation in some restaurants. You did a pretty good job, Sharon! Thanks, Shirley. Pretty addictive thing to do ..now that I know!